Cheap Cruises From Tampa - When and Where Can I Go? If you have never been on a cruise before and are unsure about destinations to pick, Norwegian has an idea that may just be what you’re looking for. One of their cruises from Tampa doesn’t actually ‘go’ anywhere, it simply, for two nights and three days allows you to enjoy the ship while you sail around in the Gulf of Mexico. If, however you do know where you want to go and that is to the western Caribbean, then the Carnival western Caribbean cruise is for you. For 8 days you are treated not only to the ship’s amenities, but also to stops in Grand Cayman, Mahogany Bay, Belize, Costa Maya and Cozumel. Alternatively, their 5 night jaunt, one of many cheap cruises from Tampa allows you to see Grand Cayman and Cozumel for just $359 per person, that’s a savings of 64% for the May 4th sailing. Because of Tampa’s location, a cruise to Cozumel is included in most itineraries that bring one of the most popular destinations in Mexico to life. 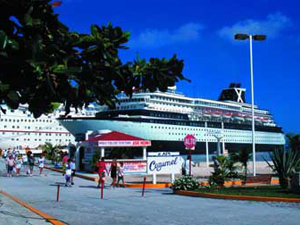 Norwegian, Carnival and Royal Caribbean all visit Cozumel from Tampa, some with only that destination on the itinerary and others combining it with other ports of call. A great example of cheap cruises from Tampa, FL is the Royal Caribbean trip just to this Mexican port, a four night trip that starts at just $299 per person on the May 2nd sailing. Holland America, just to spice things up a bit offer cheap cruises from Tampa that are billed as 16 day Azores and Spanish Expedition adventures. Visit Ponta Delgada, Cadiz, Motril, Palma de Mallorca and Barcelona, all from the port of Tampa. Norwegian offers a 19 day trip that ends in Boston, but not before it visits such port as Roatan, Belize, Costa Maya, Cozumel, Ocho Rios, Aruba, Curacao, Philipsburg, St. Thomas and Bermuda, a great sampler combining some of the best of Mexico and the Caribbean together. With its proximity to the water, it comes as no surprise that dinner cruises from Tampa are also highly popular with locals and tourists alike. Combine a great meal with entertainment and plenty of sights to behold all for much less than a full blown cruise on a major ship. If you like the water, check out all of the cheap cruises from Tampa that can give you the world, all in a port close to home.